Birth date and place c. 1837 Aldborough, Yorkshire North Riding, England. 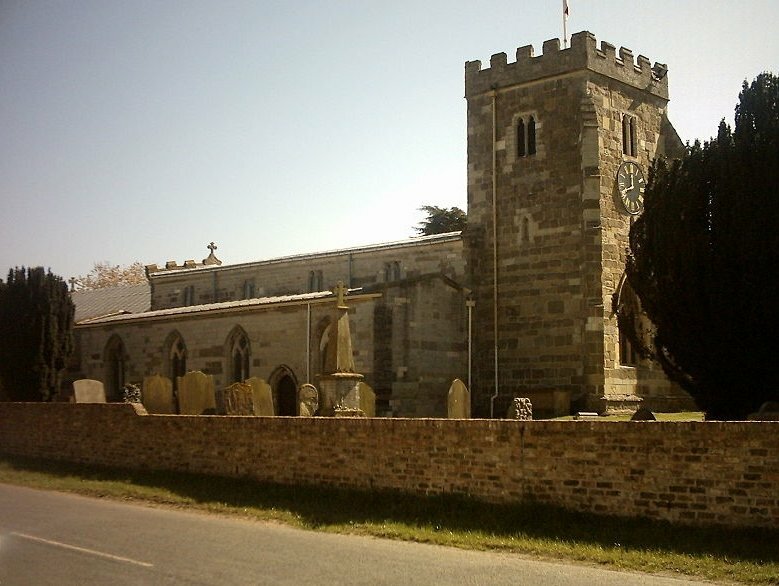 Baptism date and place 15 Oct 1837 Aldborough Parish Church, Yorkshire. Civil Census Residences Aldborough, Knaresborough, Yorkshire (1841). Spring Gardens, Aldborough, Yorkshire (1851). Physical Description Height: 5 ft. 10 ins. Complexion: fresh. Eyes: hazel. Hair: brown. Face: oval. Build: stout. Distinguishing Marks: Outline of form of a woman and bracelet crown anchor and G.B.F. left arm, double headed eagle ditto crucifix and thistle right arm, ship in full sail breast. Death date and place 27 Feb 1905 Parkside Lunatic Asylum, Adelaide, South Australia. Cause of Death: senile decay and melancholic exhaustion. Burial date and place 4 Mar 1905 West Terrace Cemetery, Adelaide, South Australia. Pauper’s Grave. Section – Road 5 Extension, Row – Church of England, Site – 1. Regiment No. and Rank #1265 Private. 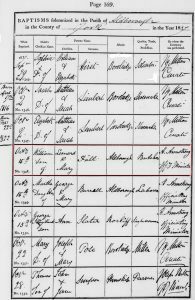 Attestation date and place 16 Dec 1853. 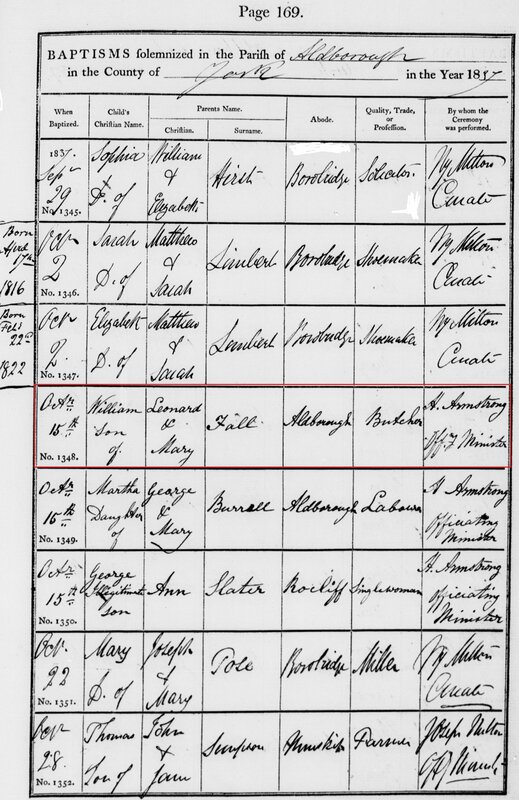 Marked absent from 20 May 1855. 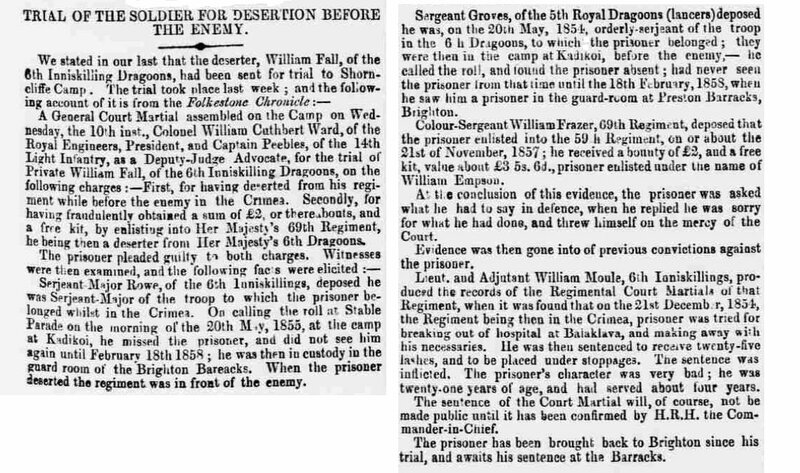 Struck off as deserter 20 Jul 1855. [Dutton & Crider]. 21 Nov 1857 (re-enlistment in 69th Regiment, £2 bounty) as William Empson. 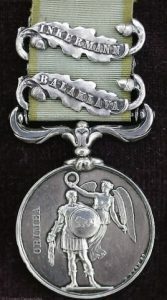 Medals, Clasps and Badges Crimea War Medal clasps Balaklava, Inkermann [WO100-24-234 & 257]. Not on Medal Roll for Sebastopol clasp. Regimental Courts Martial Tried 21 Dec 1854 Balaclava. Breaking out of hospital and making away with necessaries. Sentenced to 25 lashes and placed under stoppages. 1. for having deserted from his regiment while before the enemy in Crimea. 2. for having fraudulently obtained a sum of £2, or thereabouts,and a free kit, by enlisting into Her Majesty’s 69th Regiment, he being then a deserter from Her Majesty’s 6th Dragoons. 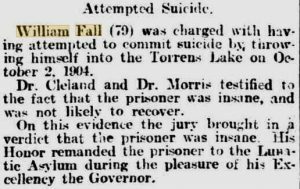 [sourced from newspaper reports – click here – courtesy of Glenn Fisher]. Sentence 8 years penal servitude. Prison and Register # Preston Barracks, Brighton 3 months 19 days. 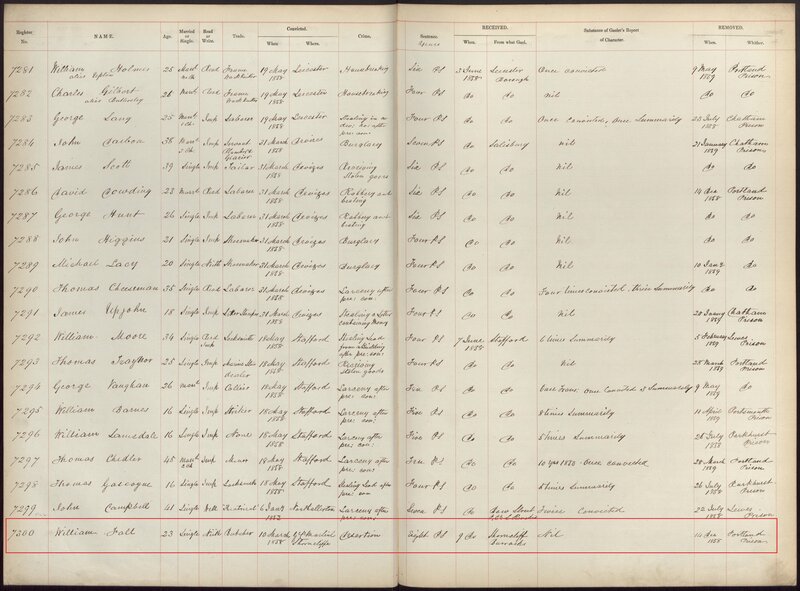 9 Jun 1858 Millbank Prison 6 months 5 days, #7300 [PCom2-41]. 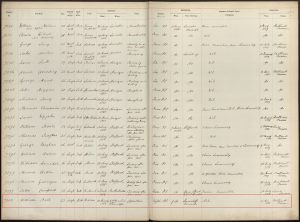 14 Dec 1858 Portland Prison #8663 [Pcom2-387]. 3 Nov 1860 Convict ship Palmerston. 11 Feb 1861 Fremantle Prison #5854. Kentish Gazette 16 Mar 1858. North British Mail – date unknown and repeated in a dozen other British newspapers. List of Veronege deserters 8 Sep 1855. Pall Mall Gazette 25 Oct 1899. WA Ticket of Leave 30 Sep 1861. WA Conditional Pardon 10 Oct 1864. WA Certificate of Freedom 23 Aug 1866. Misc. Newspaper Articles Inquirer & Commercial News 10 Nov 1875. South Australian Police Gazette 1 Mar 1876. 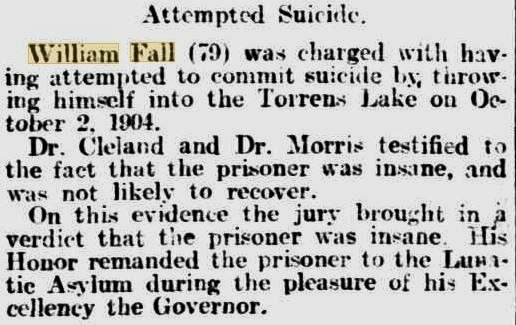 The Advertiser 7 Dec 1904. The Register 7 Dec 1904. 8 Nov 1875 Fremantle to Lacepede Bay, South Australia.